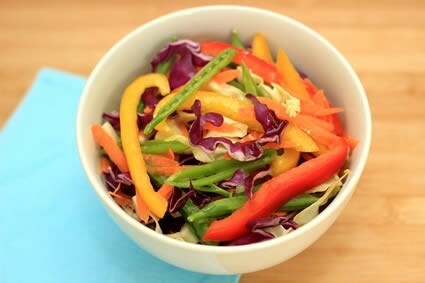 A fresh, crunchy, healthy and juicy salad with a variety of colourful vegetables. Slice up the red and white cabbage. Thinly slice the snap peas and the peppers. Toss them together in a salad bowl. You can also sprinkle fresh coriander leaves and sunflower seeds over the top for additional flavours and extra crunch!